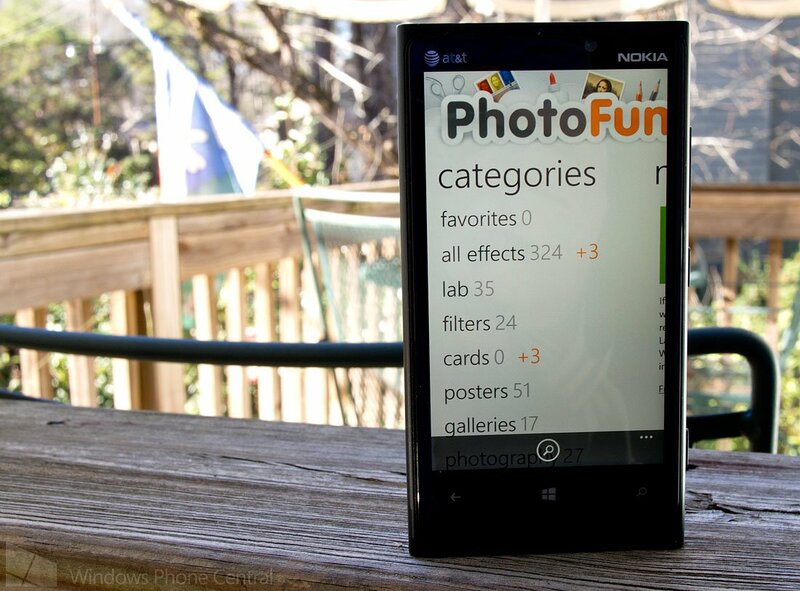 PhotoFunia is a very nice Windows Phone app for editing and customizing your Windows Phone photos. PhotoFunia won't let you crop, adjust color balance or sharpen your photos. Instead it offers over three hundred effects that can be applied to your photos. From adding a vintage photo filter to slapping your photo on a magazine cover, PhotoFunia offers a tremendous resource for being creative with your photos. And it all happens from the cloud in that the effects are downloaded to your Windows Phone and applied to your images. While this keeps the app on the light side (only 3MB) it does make a WiFi or data connection a must. PhotoFunia is a great option for applying effects to your photos and dare we say it is a must have app for your Windows Phone photography app library. 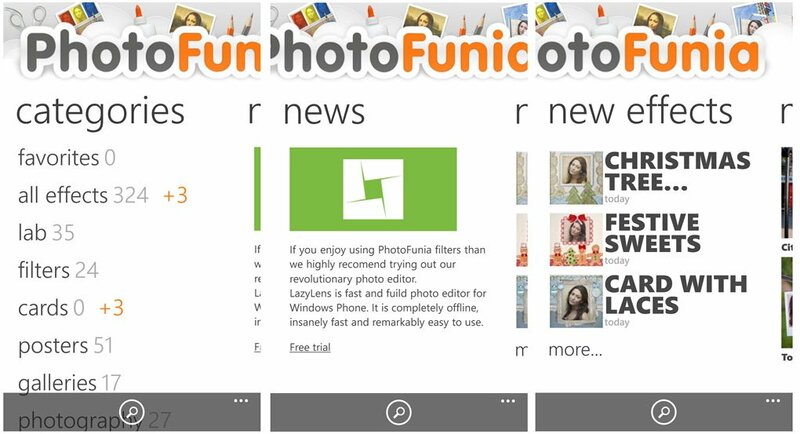 The layout of PhotoFunia has main pages listing the effects by category, view news about the app, a page listing the new effects, a page listing the most popular effects, a page listing your most recently used effects, and a gallery page of your edited photos. Settings can be found from the three dot menu off the main pages. Settings cover tile notifications, how you want the categories sorted, and set-up for social accounts (Facebook, Flickr, Twitter, Vkontakte, and Sina Weibo) for photo sharing within the app. To apply the effects, just browse your way through the catalog and when you find one of your liking a small description and sample image page will be pulled up. Each effect page is a little different but the input is straight forward. Some effects include a Sample Page to display the end result and a Related Page to display similar effects. At the bottom of each effects page you'll find three buttons; favorites, pin to start and go. Favorites adds the effects to your favorites category, the pin to start... well that pins the effect to your Start Screen for easy access, and the Go button applies the effect to your photo. Once you tap Go, the effects will be downloaded and applied to your photo. From there you have two options, share and save. Share pulls up the social accounts you set up in PhotoFunia's settings to... well.. share your creation. Save will save the image to your Saved Photos Gallery in the Pictures Hub. Some effects have the option to save the image in regular or large size. The two sizes vary from effect to effect with the large size files capable of yielding small prints but both sizes are really better suited for email/web sharing. Overall, I found Photofunia to be a fun photography app to add a lot of creative flair to images. It has the more traditional effects that can be applied and then there's the off-the-wall effects. Ever wonder what an image would look like as a tattoo? There's an effect for that. The benefit of having all these effects in the Cloud is that the developer can easily add effects without having to update the app constantly and it saves space on your Windows Phone. The downside to this is that you have to have a date connection to have Photofunia work. 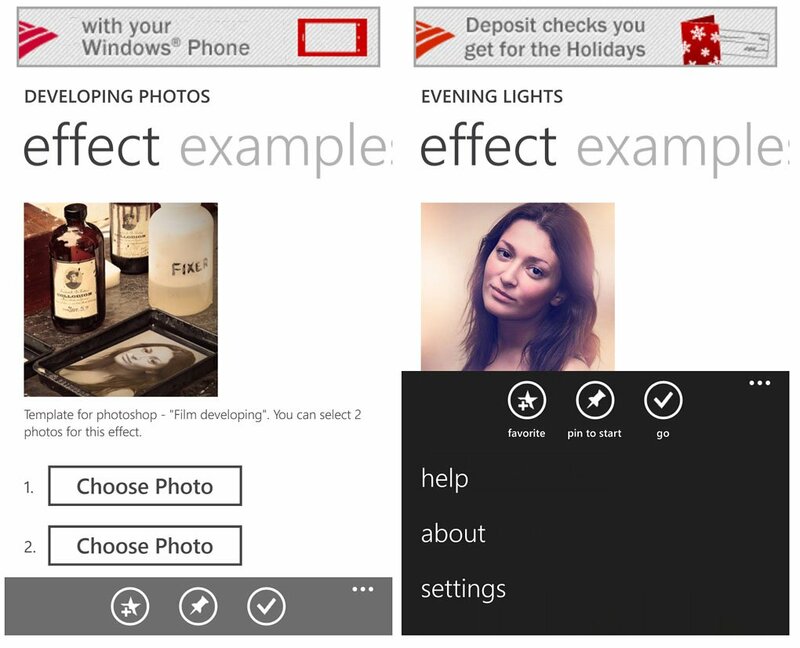 Not sure if you could download and let your favorite effects reside on your Windows Phone but that would make an attractive app even more attractive. 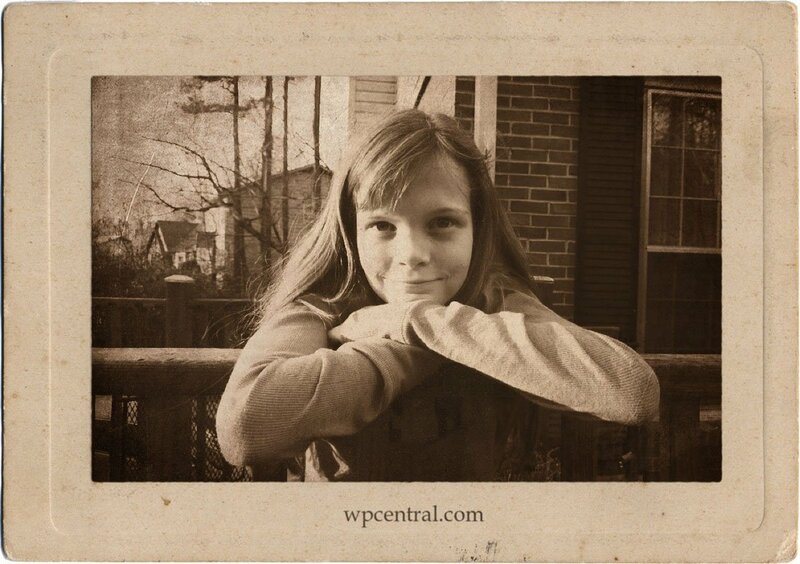 If you're looking for a vast library of creative effects for your photos, PhotoFunia is a must have app. While it lacks the basic editing tools (crop, exposure adjustments, etc.) it does have a boat load of special effects for your pictures. You're not necessarily going to be able to produce large prints from the edited images but for your online galleries or sharing the images through social websites, they'll do nicely. 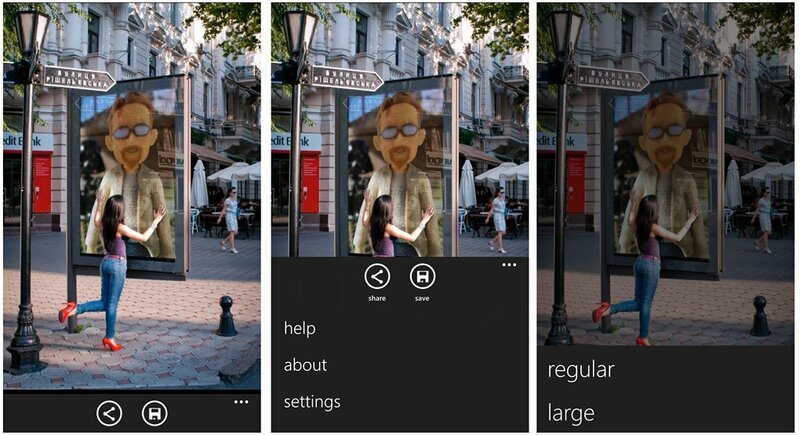 PhotoFunia is a free app that you can find here at the Windows Phone Store.